Your Go-To Carrier for Steamtable Half-Pans! Deliver bulk food from your kitchen to remote sites. 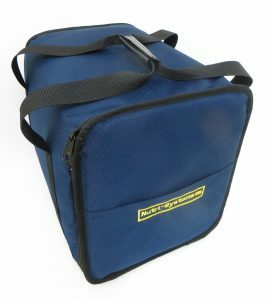 The Thermal Bag Half-Pan Carrier is extremely durable and has exceptional temperature retention. ✓ Super insulation maintains hot or cold temperatures. ✓ 3 pounds – with reinforced comfortable handles make it easy to carry heavy loads. ✓ Built-in light weight frame stays out of your way. ✓ Convenient end-loading provides direct access to any pan. ✓ Machine washable “Zip-Out” nylon liner makes cleaning easy. ✓ Carrier top can be used as a work surface. ✓ Slide out bottom tray. 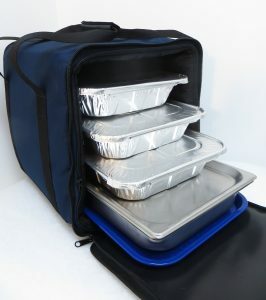 The Half-Pan Carrier is an efficient way to transport central kitchen product to your congregate sites, super insulated, hot or cold!